Professor Maniatty's general area of research is in the broad field of computational solid mechanics. Specific problems being currently investigated include modeling crystalline materials and inverse/optimization problems. In the area of modeling crystalline materials, work is being done to use micromechanics as a basis for modeling large strain metal forming problems. Work is also being done to model stresses and defect formation in thin metal films on semiconductor wafers. The other area of research involves inverse and optimization problems. This work investigates problems with either unknown boundary conditions or unknown parameters. Applications include optimization of forming processes, determining elastic stiffness in human tissue from ultrasonic measurements of displacements, and determining unknown boundary conditions in contact problems for modeling and predicting wear. 2001, First Loewy Visiting Professor in the Materials Science and Engineering Department at Lehigh University. 2000 - 2001, Selected to be a member of the Defense Science Study Group. 1996, Invited researcher, Technische Hochschule Darmstadt, Institut fuer Mechanik, Germany. 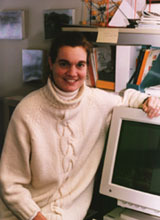 1995, Invited Participant in the National Academy of Engineering's First Annual Symposium on the Frontiers in Engineering. 1993 - 1998, National Science Foundation Young Investigator Award. 1992, Clare Boothe Luce Professorship from Henry Luce Foundation. 1992, Invited researcher, Technische Hochschule Darmstadt, Institut fuer Mechanik, Germany. 1989, McMullen Fellowship for the fall semester, Cornell University. 1988 - 1989, General Motors/COMEPP Manufacturing Research Fellowship, Cornell University, academic year. 1987 - 1988, Graduate School Fellowship, University of Minnesota, academic year.